Feodosia (Russian: Феодосия, Feodosiya; Ukrainian: Феодо́сія, Feodosiia; Crimean Tatar and Turkish: Kefe), also called Theodosia (from Greek: Θεοδοσία), is a port and resort, a town of regional significance in Crimea on the Black Sea coast. Feodosia serves as the administrative center of Feodosia Municipality, one of the regions into which Crimea is divided. During much of its history the city was known as Caffa (Ligurian: Cafà) or Kaffa. Population: 69,145 (2014 Census). In the late 13th century, traders from the Republic of Genoa arrived and purchased the city from the ruling Golden Horde. They established a flourishing trading settlement called Kaffa, which virtually monopolized trade in the Black Sea region and served as a major port and administrative center for the Genoese settlements around the Sea. It came to house one of Europe's biggest slave markets. From 1266 and on, Kaffa was governed by a Genoese consul, who since 1316 was in charge of all Genoese Black Sea colonies. Between 1204–1261 and again in 1296–1307, the city of Kaffa was ruled by Republic of Genoa's chief rival, the Republic of Venice. Ibn Battuta visited the city, noting it was a "great city along the sea coast inhabited by Christians, most of them Genoese." He further stated, "We went down to its port, where we saw a wonderful harbor with about two hundred vessels in it, both ships of war and trading vessels, small and large, for it is one of the world's celebrated ports." In early 1318 Pope John XXII established a Latin Church diocese of Kaffa, as a suffragan of Genoa. The papal bull of appointment of the first bishop attributed to him a vast territory: "a villa de Varna in Bulgaria usque Sarey inclusive in longitudinem et a mari Pontico usque ad terram Ruthenorum in latitudinem" ("from the city of Varna in Bulgaria to Sarey inclusive in longitude, and from the Black Sea to the land of the Ruthenians in latitude"). The first bishop was Fra' Gerolamo, who had already been consecrated seven years before as a missionary bishop ad partes Tartarorum. The diocese ended as a residential bishopric with the capture of the city by the Ottomans in 1475. Accordingly, Kaffa is today listed by the Catholic Church as a titular see. It is believed that the devastating pandemic the Black Death entered Europe for the first time via Kaffa in 1347, through the movements of the Golden Horde. After a protracted siege during which the Mongol army under Janibeg was reportedly withering from the disease, they catapulted the infected corpses over the city walls, infecting the inhabitants, in one of the first cases of biological warfare. Fleeing inhabitants may have carried the disease back to Italy, causing its spread across Europe. However, the plague appears to have spread in a stepwise fashion, taking over a year to reach Europe from Crimea. Also, there were a number of Crimean ports under Mongol control, so it is unlikely that Kaffa was the only source of plague-infested ships heading to Europe. Additionally, there were overland caravan routes from the East that would have been carrying the disease into Europe as well. Kaffa eventually recovered. The thriving, culturally diverse city and its thronged slave market have been described by the Spanish traveler Pedro Tafur, who was there in the 1430s. In 1462 Caffa placed itself under the protection of King Casimir IV of Poland. However, Poland did not offer significant help due to reinforcements sent being massacred in Bar fortress (modern day Ukraine) by Duke Czartoryski after quarrel with locals. Following the fall of Constantinople, Amasra, and lastly Trebizond, the position of Caffa had become untenable and attracted the attention of Ottoman Sultan Mehmed II. He was at no loss for a pretext to extinguish this last Genoese colony on the Black sea. In 1473, the tudun (or governor) of the Crimean Khanate died and a fight developed over the appointment of his successor. The Genoese involved themselves in the dispute, and the Tatar notables who favored the losing candidate finally asked Mehmed to settle the dispute. Mehmed dispatched a fleet under the Ottoman commander Gedik Ahmet Pasha, which left Constantinople 19 May 1475. It anchored before the walls of the city on 1 June, started the bombardment the next day, and on 6 June the inhabitants capitulated. Over the next few days the Ottomans proceeded to extract the wealth of the inhabitants, and abduct 1,500 youths for service in the Sultan's palace. On 8 July the final blow was struck when all inhabitants of Latin origin were ordered to relocate to Istanbul, where they founded a quarter (Kefeli Mahalle) which was named after the town they had been forced to leave. Renamed Kefe, Caffa became one of the most important Turkish ports on the Black Sea. The city was occupied by the forces of Nazi Germany during World War II, sustaining significant damage in the process. The Jewish population numbering 3,248 before the German occupation was murdered by SD-Einsatzgruppe D between November 16 and December 15, 1941. A witness interviewed by Yahad-In Unum described how the Jews were rounded-up in the city: "Posters announced that the Jews had to go to jail with food reserves for three days because they will be taken to Israel." A monument commemorating the Holocaust victims is situated at the crossroads of Kerchensky and Symferopolsky highways. On Passover eve, April 7, 2012, unknown persons desecrated, for the sixth time, the monument, allegedly as an anti-Semitic act. All native Tatar inhabitants were arrested by Russian forces as, according to Stalin, several thousand Tartars had fought side-by-side with the Nazis against Soviet forces and had participated in the Jewish genocide. No reliable source or proof exists of Stalin's allegations. Following Stalin orders, all Tartars were sent to Kazakhstan, Uzbekistan and other Central Asian republics of the USSR. Modern Feodosiya is a resort city with a population of about 85,000 people. It has beaches, mineral springs, and mud baths, sanatoria, and rest homes. Apart from tourism, its economy rests on agriculture and fisheries, local industries include fishing, brewing and canning. 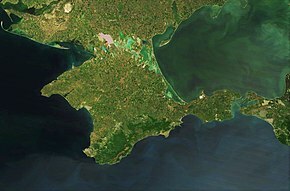 As with much of the Crimea, most of its population is ethnically Russian; the Ukrainian language is infrequently used. 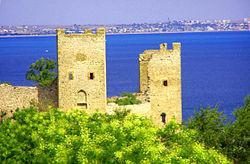 In June 2006, Feodosiya made the news with the 2006 anti-NATO port riot. An early 14th-century bishop of Caffa appears in Umberto Eco's novel The Name of the Rose, making several sharp replies in a long, tempestuous debate within a group of monks and clerics; he is portrayed as aggressive and somewhat narrow-minded. ^ Battutah, Ibn (2002). The Travels of Ibn Battutah. London: Picador. pp. 120–121. ISBN 9780330418799. ^ Wheelis, Mark (September 2002). "Biological Warfare at the 1346 Siege of Kaffa". Emerging Infectious Diseases. 8 (9): 971–75. doi:10.3201/eid0809.010536. PMC 2732530. PMID 12194776. ^ Franz Babinger, Mehmed the Conqueror and his Time (Princeton: University Press, 1978), pp. 343ff. ^ "Yahad-In Unum Interactive Map". Execution Sites of Jewish Victims Investigated by Yahad-In Unum. Retrieved 10 February 2015. ^ "ФЕОДОСИЯ. Осквернен памятник жертвам Холокоста". Всеукраинский Еврейский Конгресс. Retrieved 24 August 2012. ^ "Weather and Climate-The Climate of Feodosia" (in Russian). Weather and Climate. Retrieved 1 March 2015. ^ "Feodosija Climate Normals 1961–1990". National Oceanic and Atmospheric Administration. Retrieved 1 March 2015. Chisholm, Hugh, ed. (1911). "Theodosia" . Encyclopædia Britannica. 26 (11th ed.). Cambridge University Press. Wikimedia Commons has media related to Feodosia.